Millions of people have made the trip to Israel over the past several thousand years and have shared their experiences upon their return. The occasions of their visits are much more historically significant than ours was. I think of the time Abram first stepped on the soil of Canaan, the land God had promised him to inherit. I also think of the Israelites wondering in the wilderness and finally entering it and taking over the land. I also think of the return of the nation of Israel after the 2nd World War and once again becoming a nation. I’ve thought about and planned this trip for several years and I could go into a lot of detail about the planning process, what we packed, detailed descriptions of all the places, etc. But I have come to realize that I am in a season of life where there is simply not enough time to write about all of these things. So I would like to take a different angle on this experience, the one worth taking time out of my day to write about and to share with others. My intent is to share what the Holy Spirit was revealing through my experiences and I hope as a result, this post will resonate with you at a spiritual level. 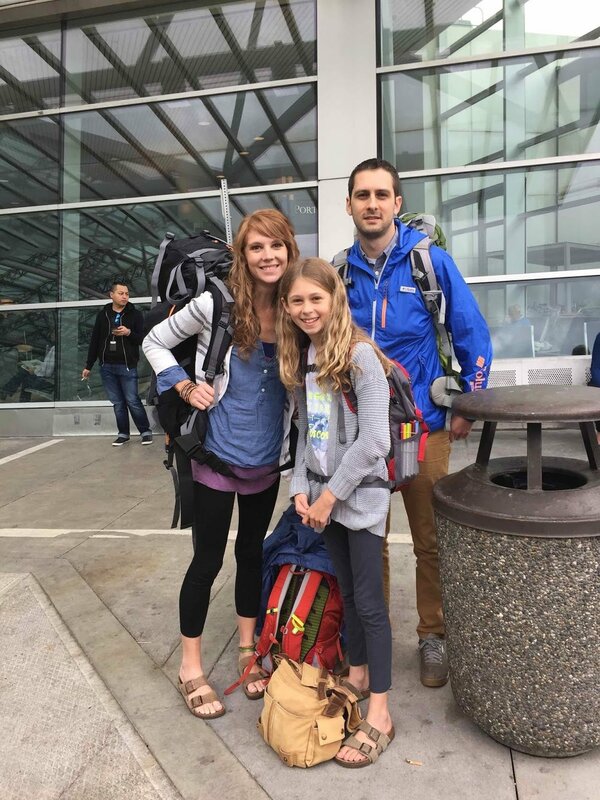 eager for Candice (my wife), Brooklyn (our 11-year-old daughter) and I to leave for our trip to Israel. I checked the Jerusalem Post to see what was going on in the place we would soon be visiting. President Donald Trump had just been in Israel the week before meeting with both Israeli and PLO leaders. My concern was that there could be increased anti American sentiment when we arrived. But the headlines for that visit were overshadowed with something more concerning. The breaking news was that there had been a stabbing attack on an IDF soldier at the Damascus Gate in the Old City of Jerusalem. This of course greatly alarmed me. The Damascus Gate a few days later would be the very route we would need to travel through in order to reach 2 of my top 3 destinations in Israel. I shared this news with Candice but I felt it best to keep it to ourselves so as not to concern family. In the back of my mind I knew that I would need to reassess the itinerary I had so carefully planned out prior to the trip. 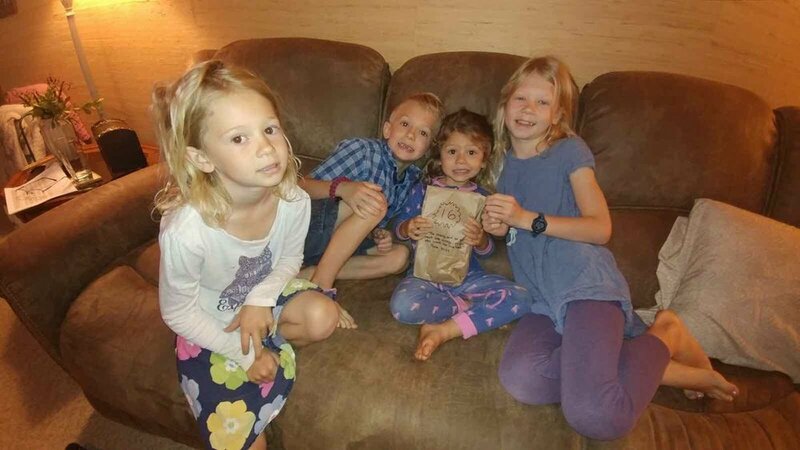 We left behind our 4 youngest children with Candice’s parents. We had tried the best we could to prepare them for us being away from them for 18 days. We knew this would be difficult for our 3-year-old daughter Breza who has little understanding of time. When we said our goodbyes, things went surprisingly well. The kids seemed in good spirits as we walked out to the car. But then something clicked in Breza’s mind and she began to cry inconsolably and wouldn’t let Candice go. After peeling her away we finally made it out of the driveway. We had anticipated that the time away from our kids would be the most difficult part of the trip and it was already off to a shaky start. Our flight left that evening and landed in Frankfurt. We had a very short time to make our connection to Zagreb and I was excited that we made it. Before the trip I figured that the chances of making this connection were about 50% and had already scheduled a Plan B for taking a separate flight. We boarded the flight 10 minutes before it departed and soon we were in Zagreb and then arrived in Sarajevo at 11PM. 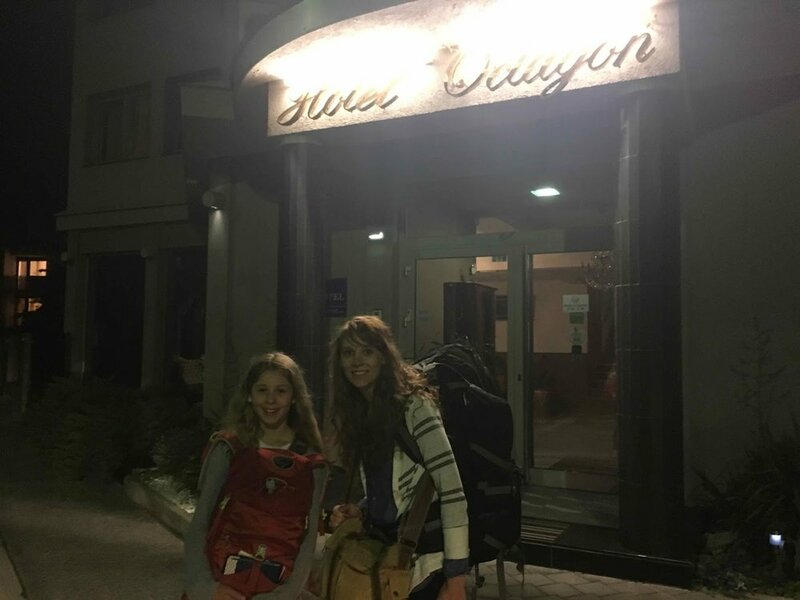 We grabbed out luggage and walked over to a hotel across the street to attempt to get a little rest. I woke up at 1AM and couldn’t get back to sleep. There was just too much excitement for this trip and too many details to consider so that it would go as planned. I checked the latest developments in Jerusalem. Details had now emerged that the attack in Jerusalem was carried out in 3 separate locations in Jerusalem including 2 places that we had planned to visit. The attackers were ultimately killed by soldiers and the Old City was on heightened security. We departed Sarajevo for Istanbul and then made our connecting flight to Tel Aviv. We were so happy to see that our luggage had made all of the connections. We had good reason to doubt that but those details are for a different time. The next step was to rent our car and drive to Jaffa for the night. This would be my first international driving experience, at night, travelling to the most populous city in Israel, on about 2 hours of sleep in the past 48 hours. Those of course are not ideal conditions for safety but I knew it was only a 20 minute drive and had rehearsed the drive already through studying Israeli road signs, watching Youtube videos of the drive, checking the route on Google Maps, etc. The drive to the hotel started off great until we got into the heart of the town. I hadn’t realized so many Israelis would be up driving and walking the streets close to midnight on a Sunday evening. The last 10 minutes before we arrived at our hotel were chaotic but we finally arrived in the parking garage. We checked in to the hotel and settled into our room and called the family back home. When we called it was Sunday afternoon on Father’s Day back home. We said a brief hello and goodnight to our kids before getting some rest. I once again had a hard time sleeping that night. I woke up early to plan our route the next day. At this point due to the lack of sleep I was overly paranoid about driving and had serious concerns for our safety. I was not looking forward to leaving our hotel and navigating through the narrow streets of Jaffa. In Sarajevo a few nights before I was watching a show where I heard the quote “Fearless people are not people who have no fear. Fearless people are people who continue on despite their fears.” This whole trip, in both Israel and Bosnia had times where I felt fearful but knew that we had to press on. I was beginning to realize that in spite of all the planning of this trip, what I hadn’t anticipated was the emotional, physical, and spiritual toll I would be operating under. My expectation was that I would be excited and ready to see the sights as soon as we arrived in Israel. The reality was that deep inside I envied the thought that we “could” cancel everything and just stay in the comfort of our hotel room for the week. But we arose early and stepped out into the streets of Old Jaffa, one of the oldest cities in the world. We walked down to the port, saw the supposed Simon the Tanner’s house, the Zodiac Fountain, the Cathedrals, and the suspended orange tree. We returned to the hotel to quickly pack up, check out, and drive over to the Israeli Defense Forces Museum. I had a special interest in seeing this place after reading the Six Days of War book a few weeks earlier. 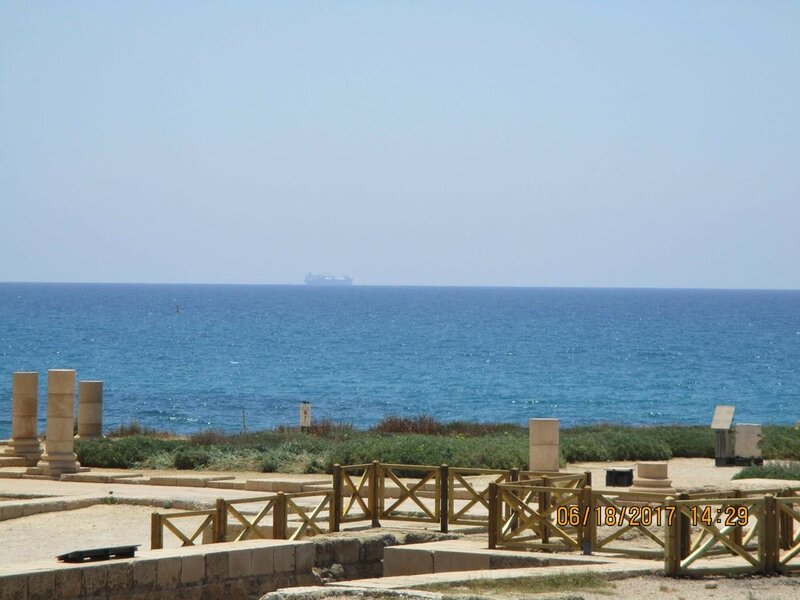 The next stop would be Caesarea National Park. By now I was feeling much better about the driving situation. I had successfully navigated through the heart of Tel Aviv and we made it onto the highway travelling northward with the Mediterranean Sea to our left. We arrived at Caesarea and enjoyed the sights while also having our first taste of falafel. Our spirits were in even better order as we got back into the car and I discovered that the car had Bluetooth! This meant that we could listen to some uplifting music as we ascended and took in the view of Mount Carmel. As the day progressed, the lack of sleep and the increased traffic was taking its toll. I felt eager to get to our destination. We had a scare when driving up to one lookout area. A large truck blindly backed out into the street and I had to swerve into the other lane with oncoming traffic in order to avoid hitting the truck! We also realized that we were very much in Palestinian territory and there was a sense of increased danger of our car being robbed if left unattended. For the first time we fell behind schedule and so I had to skip over a visit to Megido which I was not too concerned about. We continued on and were greatly slowed by traffic. Even more traffic awaited us as we arrived in Nazareth and Cana. I had hoped that this part of the trip I could take in the sights but instead was focused on driving safely up and down steep roads in busy traffic. Our destination for the day was a bed and breakfast in Chorazin, northwest of the Sea of Galilee. We were tired and I was frustrated from the driving that day when we arrived at the bed and breakfast. I remember thinking before the trip that there would be a low point on the trip and a high point and at the time not knowing if the low point or the high point is in front or behind you. I suppose that pertains to life in general. Are our darkest days still to come? Little did I know that the low point of this trip would hit us very soon. We took advantage of the internet connection here to video chart back home. At this point we learned that all 4 of our kids back home had the Norovirus, had been vomiting, and were extremely saddened by us being gone. I still remember seeing little Breza reaching out for Candice on the phone begging her to come back. After our painful goodbye, we sat there in silence while Candice was crying and I held her with no words to say. This felt like an absolute disaster. For the most part, none of us were much enjoying our time with the exception of a few moments. Candice wanted to leave Israel for home instead of Bosnia and I was still working out all the details of travel for the next few days. This was the turning point for the entire trip. We prayed for everything that was going on in that moment. I also realized that my ambitious plans for the week would need some serious amending in order to avoid additional burnout. Candice showered while Brooklyn and I went for a short walk to see the view of the Sea of Galilee. We found a small park that I had decided I would try to get up early the next morning to go to and enjoy the sunrise. The next morning, I arose around 5AM, happy to finally had got much better sleep than the previous 3 nights. I heated up some instant coffee, slipped on some shoes and walked down to the park and sat on the bench. Little did I know that this would be the highlight of the trip, only 12 hours removed from the lowlight. I sat there on the bench as the light began to pour over the sea. I was overlooking the very place where Jesus called some of the apostles, cast out demons, healed the sick, and delivered the sermon on the mount. Perhaps even where I sat was one of the places described in the gospels as a place where Jesus would withdraw to early in the morning to pray. I read through the Sermon on the Mount and prayed for the rest of our time in Israel and the rest of the trip. I had my phone on me and the song that seemed most fitting to play at that moment was Rich Mullin’s The Color Green. After about 20 minutes alone, Candice arrived alongside me. I think we both accepted at this point that our trip had only just begun and we were settling into that acceptance. From this point forward we were able to really enjoy the rest of the trip. The Holy Spirit revealed to me at this point the amazing reality of where I was sitting. All of the excitement that had built up over the years were finally realized here. I also felt overwhelmed with the amazing grace of God. The night before we had experienced only a mere glimpse into how difficult life could be without God’s hedge of protection surrounding us wherever we went. Things could be much, much worse for us and we knew that even with the current discouragements, the loneliness of the kids and their illnesses would soon get better. On our way back to the house we looked out on some rocks and got some good video of something I had hoped to see up close on this trip. 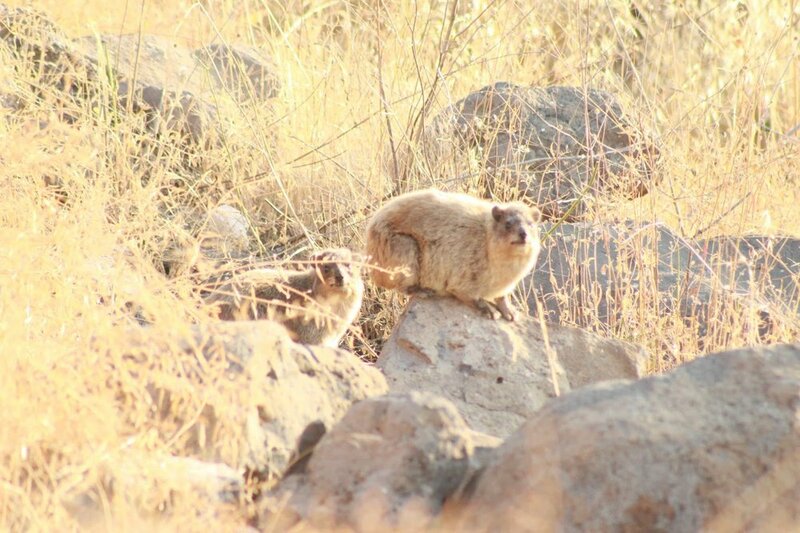 It was a family of hyrax! The plan for the day had been to visit the Mount of Beatitudes, Capernaum, the Arbel Fortress, Mount Gilboa, and Mount Tabor, and Gan Hashlosha before then driving to our rental in Jerusalem. I decided to throw out the Arbel Fortress, Mount Gilboa, and Mount Tabor and focus more on enjoying our time without such a rush. I’ll be back to Israel someday and will see some of these sights then. Somehow, I took the wrong road and we missed the Mount of Beatitudes, but we were rewarded with discovering the ruins of Chorazin. I hadn’t even realized that this National Park existed so we stopped and looked upon the sight that Jesus cursed for rejecting Him. I can attest that this place is very desolate and uninhabited except for a high concentration of hyrax and lizards everywhere you look! We next arrived at Capernaum National Park and then to the ancient synagogue where Jesus likely spoke at, cast out a demon, and caused the crowds to marvel. One thing that struck me about this place, 750 feet below sea level, was that the shores had large boulders. This is just one example of why a trip to Israel is important for our understanding of the Bible. Anytime I hear of Jesus’ ministry in Capernaum my mind assumed that the shores of Capernaum would be sandy. But that is not so. Jesus would have had to rock crawl over these boulders to arrive onto the shore before departing across the sea on His various ministry tours. Travelling along the western shore of the sea, we went through Tiberias and the mouth of the Jordan river which I only recently realized is the farthest east I have ever travelled in my life. Our next stop would be Gan Hashlosha to spend some time swimming. Since I had removed a few other stops from our itinerary, we had several hours to spend swimming instead of only about 1 hour that I had previously scheduled. I’m glad we did this because it was one of our favorite places to visit on the trip. Gan Hashlosha is a natural spring with a teal color, full of fish. It floods over an ancient water mill that you can now swim around. We used this time to take some underwater view with Candice’s new Go Pro camera. A 2 ½ hour car ride to Jerusalem was next up. We arrived in Jerusalem around 6 and found our AirBnb rental home. We went up to the rooftop to take in our first view of the Old City. That night we walked a few blocks down to the Old Train station that has now been converted into an outdoor shopping center. We bought some groceries and got back to our rental home in anticipation of a lot of walking the next day in Jerusalem. I also read up again on the situation in Jerusalem. No additional attacks had taken place since the previous Friday. Since security was heightened, I reasoned, then things would actually be even safer now than they had been a week earlier. We hiked from our rental all the Chapel of the Ascension on the Mount of Olives. Along the way we stopped at the Garden of Gethsemane, Dominus Flevit, the tombs of Jehoshaphat, Absalom, and some of the prophets who wrote some of the Old Testament books. What a view at the top! We then went to the City of David ruins and walked through Hezekiah’s tunnel. Then we finally entered within the Old City walls en route to the Garden tomb north of the city. This was now the time when I was most concerned for our safety. I had only heard a few days earlier that it was the month of Ramadan, a time for Muslims to fast, give alms to the poor, and spend time in prayer. This meant that a lot of Muslims were entering into the city to pray at the Al Aqsa Mosque on the Temple Mount. We finally arrived at the Damascus Gate with a flood of humanity pouring into the city from the opposite direction. We worked our way shoulder to shoulder against the crowd and finally out into the outside of the city unscathed. We crossed the street and fought against the crowds, street vendors, and heat some more and finally came upon a sign that read “The Garden Tomb”. This is where Jesus’ was believed to be buried after his crucifixion. 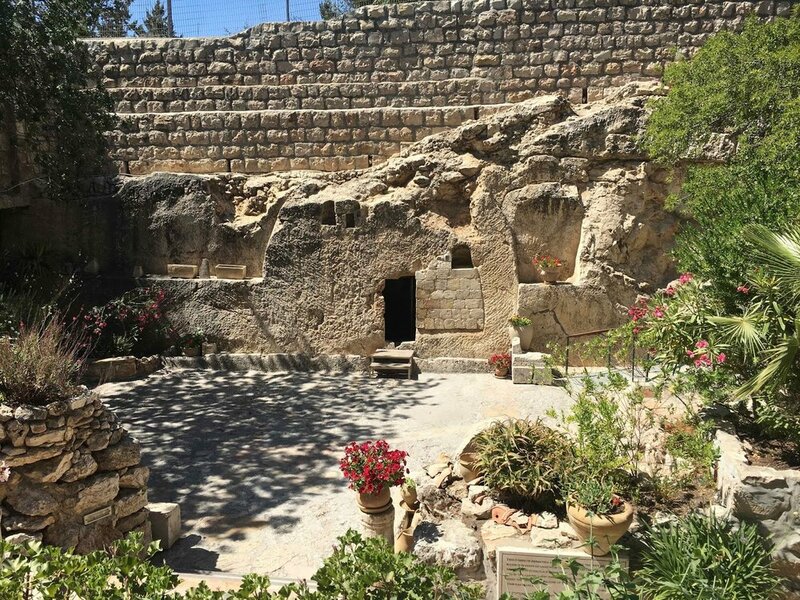 Next to the Garden Tomb is “Gordon’s Calvary” where there appears to be a skull in the side of the mountain…Golgotha, the place of the skull. Is it possible that this is where Jesus was crucified and is perhaps the most significant place in the entire universe? If so, it is ironic that the very place where Jesus died for our sins is now a polluted parking lot for buses. I have conflicting feelings about this. A place of such great importance should be highly honored. Yet I also find it perfectly fitting that it isn’t. All over the world and throughout history places of spiritual significance have had cathedrals, mosques, shrines, and the like built over them. Throngs of people flood to these areas each year and come away feeling that closeness and righteousness before God correlates with their proximity and devotion to these places. It doesn’t sit well with my soul to see this happening and I think God has protected this place over the millennia by not allowing these places to be identified until somewhat recently and for them to not become a large tourist destination. Ravi Zacharias, a Christian Apologist, explains this phenomenon well. We had planned to visit the Via Dolorosa and the Church of the Holy Sepulcher but those were low on my list because I am simply not convinced that these are the places mentioned in Jesus’ crucifixion. We also had other things to deal with. We had to go back through the Damascus Gate and find our way through the confusing streets of the Old City to the Western Wall in preparation for our tunnels tour. We finally arrived at the Western Wall and asked a Russian lady to take a picture of our family here. She took 5 pictures in order to get the perfect shot. Later that night I found that her finger was covering all of them. I find this very amusing. By this part of the trip I had resigned myself to take all disappointments in stride. God is in control of all things and I need to focus on the good and let the bad things go. I’m happy though that I got a separate picture of Brooklyn and Candice here. Finally, we took a tour of the tunnels and excavations at the Western Wall before returning back to our room. On the way back I snapped this photo of the entrance to the cemetery where Oskar Schindler is buried. We watched Schindler’s List again a few weeks before our trip. We are grateful for people like him who risk their lives for the sake of God’s Chosen people. There were a lot of things we planned to do the next day that were scrapped. The original plan was to visit Beit Guvrin National Park, Tel Azekah (where David fought Goliath), visit Yad Vashem, and then the Israel Museum, Bible Lands Museum, and Shrine of the Book where the Dead Sea Scrolls are stored. Since we had walked so much the day before we had to cut out our trips to Beit Guvrin and Tel Azekah. We visited Yad Vashem first and then parked at the Bible Lands Museum. The girls were anxious to shop since we hadn’t shopped at all the day before as planned. So we decided to walk up to Machane Yehuda, the Jewish Market. When we arrived we were disappointed that it was more suited to buying food than souvenirs. This was frustrating for all of us. It was not in our plans to even visit the Jewish Market and when we penciled it in, it didn’t accomplish what we had set out to do. We took a taxi back to our car and then cancelled our museum visits. Instead we drove to the Jaffa Gate of the Old City and re-entered the Jewish market area. Here we finally got our souvenir shopping in but at the expense of missing the museums. Friday was our last day in Israel and included our visit to the Dead Sea. The Dead Sea is in the West Bank, controlled by the PLO, so I was on a bit higher alert though the sites we visited are very touristy and are generally very safe to visit. We drove to Masada and took the cable car up the mountain overlooking the area. If you don’t know the significance of Masada I would really suggest you reading about it on Wikipedia. Then we drove to En Gedi. This place was awesome and refreshing to go into the water. I could just imagine David sitting by these waterfalls as he penned some of the great Psalms of despair and reliance on the Lord. By the time we left En Gedi it was too late to visit the Qumran Caves where the Dead Sea Scrolls were found. Qumran closes early on Fridays due to the Sabbath that begins at sunset on Friday night. So, we then drove to Kalya beach to experience a swim in the Dead Sea. This was quite disappointing to each of us. It was severely hot, very touristy, muddy, expensive to get into, and left us feeling really gross with a film of salt on us. True there are places to shower off at, but only on the outside of your swimsuit! Overall, I don’t regret visiting here. We can say we stood at the lowest point on earth -1300ish feet below sea level and that we experienced floating high on the water. It’s a fun place to remember as I sit here on my comfy couch but at the time I was not too impressed. The next day we began our trip back. We had to check out of our AirBnb, return the rental car, and get to the airport in time to return to Sarajevo for our time in Bosnia. Make a plan but set low expectations. I have found that this principle is a great key to living a joyful life. When we set high expectations on ourselves or on others then what typically happens is that nobody can live up to those expectations and our lives follow a pattern of continual disappointment. You are guaranteed nothing in life. On this trip I had a plan that I had been working on for over a year. I would not let unintended changes to this plan rob me of my joy. We need to plan so we have a target to aim for but we also need to roll with the punches and realize that God may have other plans, plans that are better than ours. In hindsight, if things had gone as I planned then I wouldn’t have had such a rich experience as what actually happened. I am not advocating for living a life of pessimism. But the person who sees the glass half full rather than half empty is the person who didn’t expect to have any water in the first place. I understand that visiting Israel for the first time and traveling by car is not what most people would do and is a scary thing to consider. I am not exactly a fearless person. There are many areas in my life where I need to put the fear behind me and move on, and this is usually the case in personal relationships than in interacting with the world. Remember that many great, enriching opportunities in life will be missed if you are looking for the easy way out. The turning point of this entire trip was when I intentionally took time to be with God and spent time in prayer. It made all the difference and took me from the low point of the trip to the high point within a matter of hours. We have a tendency to want to be on the go all the time. We need to plan times in our life regularly to step back and look at the big picture. Thank you for taking the time to read this. I’ll remember this trip for as long as I live. I hope to post about Bosnia soon. Other amazing life lessons were learned there as well.